Credit LSU for being a hospitable host…even if it's technically not the home team. Les Miles' program is going above and beyond to make Tiger Stadium “home-like” for South Carolina on Saturday. The Gamecocks will be benefitting from a musical concert catered to their needs courtesy of the LSU marching band. 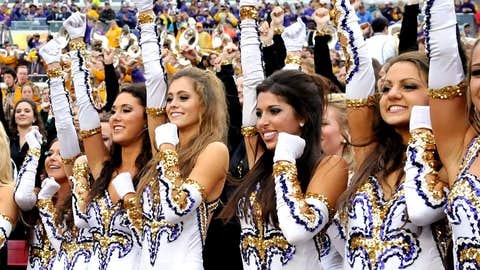 “The Golden Band from Tigerland” will play “Sandstorm” during the pregame festivities, according to LSU SID Michael Bonnette. This comes on the heels of the announcement in which the band will also learn South Carolina's fight song and alma mater. While the Tiger Stadium crowd won't be decked out in garnet and black, the playing of “Sandstorm” will likely resonate with Steve Spurrier's players before the contest begins. #LSU SID Michael Bonnette has confirmed to me that LSU will play "Sandstorm" before kickoff. A #SouthCarolina pregame tradition.